The open arm clip range. 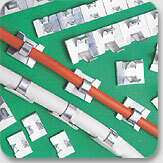 Cable type - round - single or multiple cables. Large self-adhesive base area, acts instantly. Sold in multiples of 250 pieces, minimum order 1,000 pieces. Prices and further technical and application details available on request.